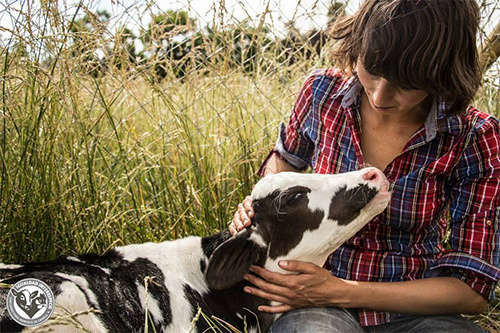 Rescued from slaughter as a calf, Salvador loves to show his affection for the people who saved him. When he was very little, Salvador's fate was grim. He was born on a Chilean dairy farm, where his mother was a dairy cow. Because he would never produce milk, he was set to be slaughtered for 'veal'. Instead of being considered a 'waste product', Salvador is enjoying all the love and care that he deserves. Now he spends his time basking in sunshine, and getting his daily quota of snuggles. Sadly, unwanted male calves are victims of the Australian dairy industry, too. Each year hundreds of thousands of 'bobby' calves are killed in their first week of life. But you can help save calves like Salvador right here at home by joining the growing number of Aussies going deliciously dairy-free.